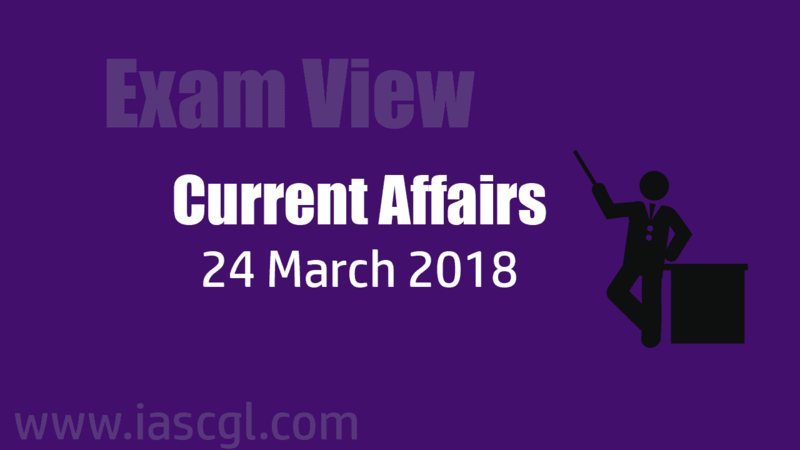 Current Affair of 24 March 2018, Exam View. Aim of Green Budget is to controlling pollution and monitoring its impact on the environment. This is the first “Green budget” of the government for effective containment of pollution in the city. Kerala, which last year became the first State to declare Internet a basic human right, has notched up another first by launching mKeralam, an app that will serve as a single window for accessing thousands of government services. The services accessible via mKeralam are already available through www.kerala.gov.in. Andhra Pradesh Chief Minister N Chandrababu Naidu launched the Naipunya Ratham, a multi-utility vehicle. As part of the ‘Smart Village Smart Ward Programme’ of the state, the Naipunya Rathams will facilitate and look to improve digital literacy and digital skills. It aims to create opportunities in underserved communities and empower people everywhere to build a better and more prosperous life. Naipunya Ratham is a part of HP's commitment to build and deploy 48 Internet-enabled digital inclusion and learning labs in PPP model, aimed at driving digital literacy, E-education, Entrepreneurship training and other citizen services in rural India. The announcement of a State of Emergency was precipitated by a Constitutional Crisis created by two Justices of the Supreme Court who conspired with political actors to violate both the Constitution and standard legal norms and practices in order to illegally overthrow a lawful Government, and whose actions constituted an imminent threat to national security. The Cabinet Committee on Economic Affairs had given its approval for Central Sector Scheme "Integrated Scheme for Development of Silk Industry". The core objective of the scheme is to improve the productivity and quality of silk through R&D intervention. It will promote Women Empowerment and livelihood opportunities to SC/ST and other weaker sections of the society by 2020. It will be implemented by the Ministry through Central Silk Board (CSB). The Dravidian language family, consisting of 80 varieties spoken by nearly 220 million people across southern and central India, originated about 4,500 years ago, a study has found. The Dravidian language family’s four largest languages — Kannada, Malayalam, Tamil and Telugu of which Tamil reaches back the furthest and along with Sanskrit, Tamil is one of the world’s classical languages.